โดย ASTVผู้จัดการออนไลน์ 3 กุมภาพันธ์ 2555 17:05 น. There was an interesting piece of news last week that really impressed me about the cleverness of the guy in the story. The man was earning over 100,000 baht a month from begging _ far higher than the government's proposed 15,000 baht monthly salary for a new university graduate holding a bachelor's degree. With his wife acting as the guide, the man put on a pair of dark glasses and feigned blindness. The couple popped in and out of restaurants in Chon Buri, collecting change from the compassionate and earning 3-4,000 baht a day. Their game unravelled only after the couple had an argument. The wife grumbled about the husband's "big spending" at their rented air-conditioned bungalow, and a fight ensued. Police were called in to investigate the disturbance. Before setting up his own begging business, the man used to lead other (really) blind people in singing for money at restaurants in Bangkok. When he realised how much money could be earned this way, he went his separate way and launched his own enterprise, with the wife acting as a guide escorting him. This is not a new phenomenon; we have often heard about fake beggars or beggars who have saved astonishing amounts of money. Bit this is just the income earned by a single couple, or we can say a small entrepreneur. If we extrapolate the income from the numerous begging gangs, I believe the amount would be a hundred times more. A report by the Mirror Foundation indicated that begging gangs use babies or children up to seven years old, the disabled or the elderly, as tools to draw sympathy, and thereby earn as much as 10,000 baht a month. One unattractive consequence of attractive earnings from begging is that it leads to human trafficking, child kidnapping and/or violation of children and their rights. What is the reason for this problem? Should we blame the Thai people for being generous and kind, which in turn has intensified the problem of begging in our country? There have been reports that good earnings have led begging gangs in Cambodia to send their members across the border to work here. Besides begging, there are other ways of getting generous people to part with their money. A friend of mine once saw a man standing at a BTS station looking dazed and with blood apparently seeping through his trousers. Several people approached, and he told them he'd been injured but did not have the money to return to his home in the rural countryside. Some people gave him hundreds of baht even without being asked. Later, this very same fellow was spotted faking the same routine at other BTS stations. Who should we complain to, as generous people were willing to hand him their money? Whose fault is it? Earning money through people's gullibility may not seem as worrisome as being threatened by a thief who's after your wallet. While I was relaxing at home one day, a group of four people rang the door bell and asked me to come outside. Their leader asked for a donation so as to purchase coffins for those who'd died without any relatives to help with the funeral expenses. I'd heard about this before and had been warned by one such foundation that they never sent volunteers or staff to knock on people's doors for donations. There are different thoughts on this issue. 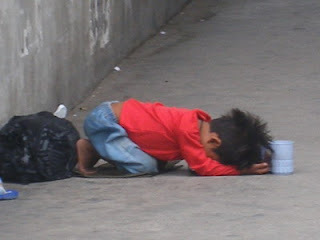 A friend told me that child beggars are usually forced by "mafia gangs" to beg. My friend said he was willing to give money to children because his little donation might possibly save the child from punishment when short of the required target. I, on the contrary, view that handing money to child beggars only helps to promote human trafficking. People may think differently. There is no right or wrong, but I would like to urge concerned government agencies to solve at least one problem regarding child beggars. Is it possible for the agencies to round up child beggars from the streets, the flyovers and restaurants without returning them to those who falsely claim to be their parents? These children could be adopted by new families or sent to home shelters, giving them an opportunity to receive an education. Though we wouldn't be solving all the problems connected with begging, we might at least be able to help bring about a better future for some of these children.Somporn Thapanachai is Deputy Business Editor, Bangkok Post.